I too look forward to having ‘no hand, act or part’ in pensioning her off the Europe. Not one. Small wonder she fitted in so well with that cabinet. A disgraced and disgraceful former justice minister who was effectively fired for misleading the Dail on several occasions. 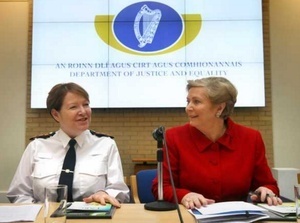 As justice minister, she presided over so many unresolved scandals, breath tests, groundless convictions, falsified and underrecorded crimes, financial irregularities in Garda bank accounts in Templemore and in Dublin. And her lack of support for Sgt McCabe was shameful, how long did it take her to meet him after she assumed office? FG have little credibility in the real world as it is, but this is just nuts. You’d think someone in the party would say, you know what “this is a bad idea”. Hope she doesn’t do too much nodding. That star could do damage. 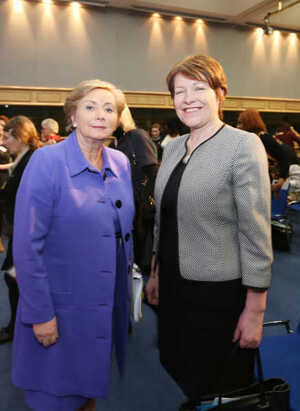 Awaiting her understudy Harris’s interview extolling the virtues of his FG mammy. She’s my TD and she is utterly crap. She sends around these ‘OAPs, know your rights’ brochures several times a year because the age profile of my area would be 50+. Utterly pointless representative, all the while there are literally hundreds of houses being squeezed into the N4 corridor, which is already past peak congestion each morning. I do want to see more homes built, they need to be, but where is the infrastructure? There is literally nothing additional, including buses, transport wise being put in (unless you count the upcoming bus swapping joke which will be a complete failure if I am to go on the competency of Dublin Bus so far). 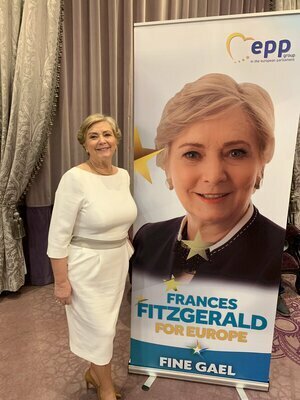 But good Old Franny thinks she is up to play with the big boys abroad and fupp those constituents who did vote for her. I have a feeling she won’t get in, I definitely hope she doesn’t, one of the bewildered wing of FG, along with the likes of Charlie ‘I don’t know’ Flanagan. Two idiots who haven’t a clue. Your otherwise excellent points notwithstanding, a 50 year old is a long way from becoming an OAP. It’s perfectly possible for someone becoming an OAP tomorrow to have a child aged 50. They want here to “go away’ but only as long as she can take up an new pensionable job. Who’s the woman in the picture beside Fitzgerald? if anyone has seen the movie Trolls….. When I see her all I think off is…”Bad Bergen, bad bad bad Bergen”.